So due to yesterday's post, I couldn't help myself tonight. I had to head back to the Hong Kong diner, 好好味菠蘿包, at Shida night market for a proper dinner and try out their Cantonese food. You all remember the post from yesterday, so I can save the normal yapping and head straight to the food. I ordered some pork short ribs over rice. Excellent! The pork was soft and has some soft bone, but they're short ribs, what do you expect. The pork turned out to be just chewy enough and no where near dry. Excellent pieces of pork short ribs similar to what you'd find at a Dim Sum place. The rice they use is some long grain white rice, that was soft and not sticky, just the way I like it. And the sauce...to die for. I'm not familiar with it, but perhaps it was some sort of XO sauce, Yuki guesses. A high price tag of $130 NT for a simple dish, but the taste is just about worth it. I should be able to make this at home right? Yuki ordered a noodle soup, 金牌車仔麵. I'm not sure what's in it. Typical Hong Kong style, it's a mix of several cultures and cheap ingredients. 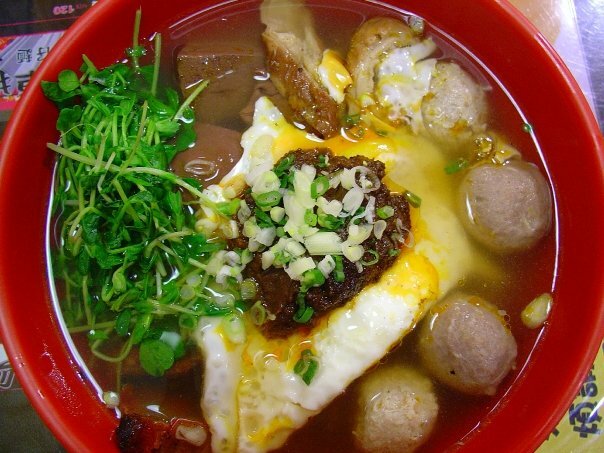 I see egg, sprouts, duck blood, beef balls, ramen noodles, green onion and intestines (*Stolen from Google Images). I'm no expert, but I've never actually seen this dish in Hong Kong, but it certainly plays the part of a HK dish. Looks and tastes like a hodge podge of random leftovers from the pantry, like you do when you're trying to clear your fridge before moving day. It's not award winning by any means, but maybe it's in my blood. 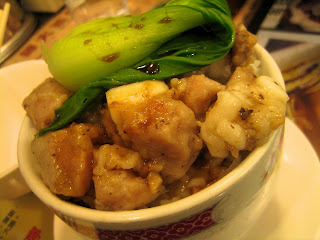 I love this down-home, simple, cheap, hodge podge of ingredients that I think makes up most Hong Kong 茶餐廳 dishes. And of course, you can go here with out a pineapple bun finisher with loads of artery cloggin' butter.